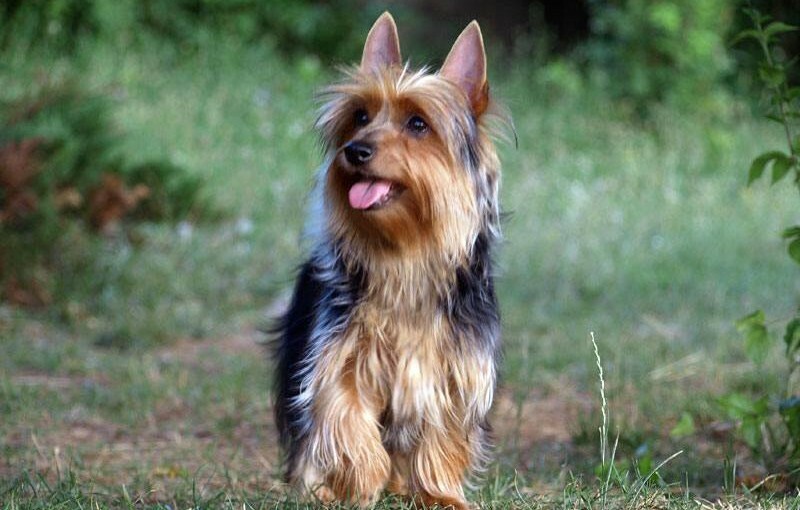 Silky Terrier was developed in Australia in the early 1900s. 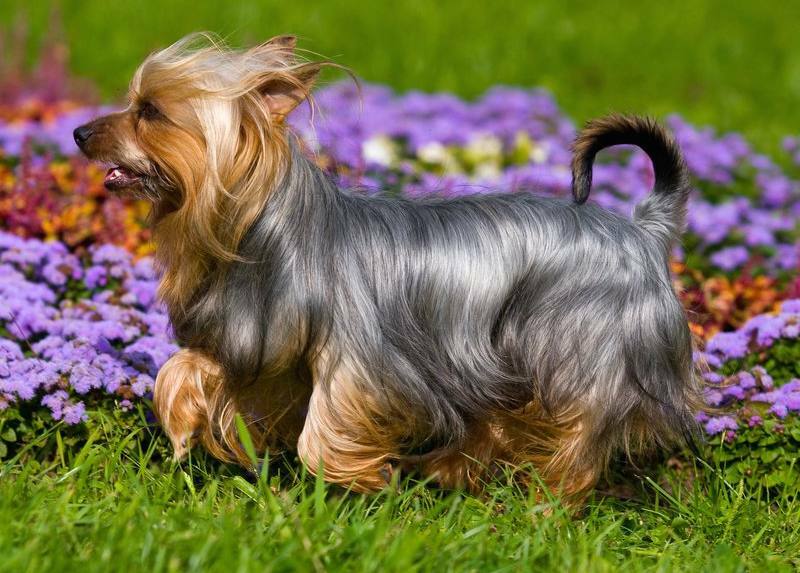 The silky is primarily a blend of Australian Terriers and Yorkshire Terriers. Differing opinions led to two separate standards being drawn up – one in Sydney and the other in Victoria. 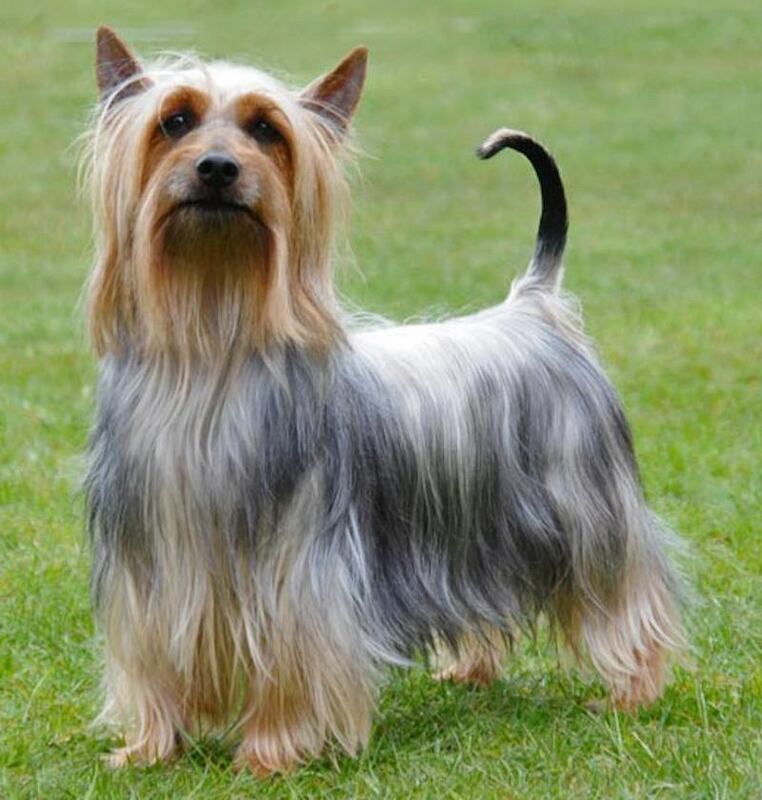 In the first instance, the breed was known as the Sydney Silky Terrier and in the latter it was called the Victorian Silky. In 1959, the Australian National Kennel Council adopted a single standard and renamed the breed as the Australian Silky Terrier. The breed’s sole purpose has been to serve as an attractive and delightful household pet. General Appearance: The Silky Terrier is a lightly built, moderately low set, companion dog of pronounced terrier character and spirited action. Temperament The keen, alert air of the terrier is characteristic, with shyness or excessive nervousness to be faulted. The manner is quick, friendly, responsive. Size: Weight ranges from 8-10 lb. (4-5 kg.). Shoulder height from 9-10 inches (23-25 cm). Pronounced diminutiveness (such as a height of less that 8 inches [20 cm]) is not desired; it accentuates the quality of a toy dog as opposed to the breed’s definite terrier character. Coat and Colour: Coat flat, in texture fine, glossy, silky; on matured specimens the desired length of coat from behind the ears to the set on of the tail is from 5-6 inches (13-15 cm). On the top of the head the hair is so profuse as to form a topknot, but long hair on face and ears is objectionable. Legs from knee and hock joints to feet should be free from long hair. The hair is parted on the head and down over the back to the root of the tail. Colour blue and tan. The blue may be silver blue, pigeon blue or slate blue, the tan deep and rich. The blue extends from the base of the skull to the tip of the tail, down the forelegs to the pasterns and down the thighs to the hocks. On the tail the blue should be very dark. Tan appears on muzzle and cheeks, around the base of the ears, below the pasterns and hocks, and around the vent. There is a tan spot over each eye. The topknot should be silver or fawn. Head: The head is strong, wedge shaped, and moderately long. The skull is a trifle longer than the muzzle, in proportion about three-fifths for the skull, two-fifths for the muzzle. Skull flat, and not too wide between the ears. Stop shallow. The nose is black. Teeth strong and well aligned. Scissors bite. Eyes dark in colour and piercingly keen in expression. Ears small, V-shaped and pricked. They are set high and carried erect without any tendency to flare obliquely off the skull. Neck: The neck fits gracefully into sloping shoulders. It is medium long, fine and to some degree crested along its topline. Forequarters: Well-laid-back shoulders, together with good angulation at the upper arm, set the forelegs nicely under the body. Forelegs are strong, straight, and rather fine boned. Body Low-set, about one fifth longer than the dog’s height at the withers. The topline is level. A topline showing a roach or dip is a serious fault. Brisket medium wide, and deep enough to extend down to the elbows. Hindquarters: Thighs well muscled and strong, but not so developed as to appear heavy. Legs moderately angulated at stifles and hocks, with the hocks low and equidistant from the hock joints to the ground. Feet small, cat-like, round, compact. Pads are thick and springy while the nails are strong and dark coloured. The feet point straight ahead, with no turning in or out. Tail: May be docked or undocked, both are equally acceptable. On docked dogs, the tail is set high and carried erect or semi-erect but not over gay. It is well-coated, but devoid of plume. On undocked dogs, the first 3 vertebrae to be carried erect or semi-erect, the balance to be a sickle which may point towards the head. The tail set must be correct, not over gay. It is well-coated, but devoid of plume. Gait: Should be free, light footed, lively, and straight forward. Hindquarters should have strong propelling power. (a) Shyness or excessive nervousness. (b) A bite markedly undershot or overshot is a serious fault. (c) Light eyes are a fault. (d) A too-short body is a fault. (e) White or flesh-coloured nails are a fault. (f) Toeing in or out on the move is to be faulted.